The Ister is a philosophy documentary that was made on a shoestring by two Australian graduate students. The basic idea was a brilliant conception – so ingenious that I desperately wanted to see the film as soon as I heard about it. 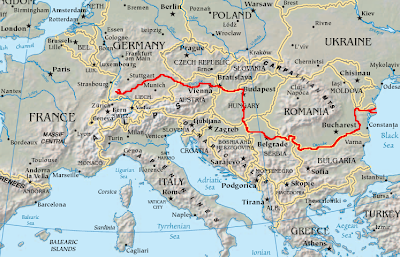 It traces the entire course of the Danube river under the inspiration of Friedrich Holderlin’s poem, The Ister (the Greek name for the Danube), and Martin Heidegger’s 1942 lecture on that poem (see “Existentialism in Film 1”). By following this course, the film takes on Heidegger’s later philosophy and a number of associated subjects related to European history, Continental philosophy, and time. Admittedly, such subject matter is esoteric, but the potential audience for this material is larger than you might think. Unfortunately, despite the brilliant premise of the film and the intellectual expertise of the creators (Ross wrote his PhD thesis on some of the material covered in this film), the film is a disappointment for me, and I will try to explain why. I will also explore what the film is about, since I don’t think other commentators have caught on to one of the main themes. First, though, let me explain a little about the structure of The Ister. It consists of essentially four interviews of European intellectuals who have involved themselves with the work of Holderlin and Heidegger. These interviews were conducted in 2000 and are interspersed with mostly decorative footage of various sites along or nearby the river. The riverscape material is, for the most part, sequenced in the “up river” direction, starting out from the river mouth onto the Black Sea. By the end of the film, we have reached the (still disputed) source of the Danube, which is not far from Heidegger’s own forest retreat The four intellectuals are three French academic philosophers who have written about the connection between philosophy and film theory, Bernard Stiegler, Jean-Luc Nancy, and Philippe Lacoue-Labarthe, along with avant garde German filmmaker Hans-Jürgen Syberberg, who is also an intellectual with a PhD. The interviews are basically off-the-cuff lectures, rather than interviews, since there is no dialogic interaction with the subjects (the filmmakers have no first-person presence in the film). The lectures are also mostly sequential: first Stiegler, then Nancy, then Lacoue-Labarth, Stiegler again, and finally Syberberg, which means that we are really sitting through four (or five, if you credit Stiegler with two) lectures on philosophy. Interspersed among the lectures are some sites along the river. These include the Histria archaeological site from Roman times (Romania), the recently (1999) NATO-bombed town of Novi Sad (Serbia), Vukovar (Croatia), Dunaujvaros, which has had many names, including “Stalin City” during the Soviet era (Croatia), Vienna and the Mauthausen-Gusen Nazi concentration camp (Austria). There are also sites in Germany, including the Walhalla temple of mythic German heroes near Regensburg. But much of the non-interview visual material just consists of shots of the river, itself, or bridges crossing the river, and many of the same shots are repeatedly reused as visual cover for the voice-over material for the four lecturers. Let not propositions and ideas be the rules of your being. The Fuhrer alone is the present and future German reality and its law. Heidegger remained in Germany throughout World War II, and even after the war he was largely unrepentant about his Nazi loyalty during that period. Since 1989, more material has been published and discussed about the extent of Heidegger’s Nazi involvement and his lack of sympathy for Jews oppressed by Naziism, and so it is now no longer possible to dismiss his participation as someting unconnected with his thinking. The question still rages in academic circles today: does Heidegger’s philosophical position have intrinsic affinities with fascism in the political sphere? This is one of the principal themes of the film, The Ister. In addition to Heidegger's politics, there are also controversies concerning the evollution of his thought. Shortly after Heidegger wrote Being and Time, he began to move away from the central aim of that work, which was to build up an understanding of being by means of existential phenomenology. There is much speculation as to why he made this move, but it seems largely associated with the idea that the very foundations of our language prevent us from arriving at a proper understanding of existence, and in particular, our own existence, or “Dasein”. This problem began, according to Heidegger, at the time of Plato and Socrates, who established a conceptual understanding of the world based on its essences. This mode of thinking leads us, for example, to see humans as essences, or things, and to miss out on the true existential richness of human experience. Everything then becomes material and available for manipulation (“standing reserve”, in Heidegger’s parlance). This Platonic movement towards essentialism, according to Heidegger, was a wrong turn, and for the last 2,400 years we have been moving in the wrong direction – a direction away from an authentic understanding of our existence. By the 1940s, Heidegger had identified technology, itself, as a fundamental socio-cultural force that was relentlessly driving our society towards ever more materialistic (and thus inauthentic, non-existential) thinking. Most Anglophone readers are familiar with this Heideggerian theme from his The Question Concerning Technology (1954), but a significant earlier presentation of this viewpoint was in his 1942 lecture celebrating Holderlin’s hymn, The Ister. Although it is not clear that Heidegger was a true fascist, it is definitely true that he despised both Communism and democracy, which he felt were dominated by inauthentic technological thinking. Thus the two growing world powers, Soviet Russia and the United States, were equally harmful to the future of mankind. For Heidegger, it was up to Germany to shun both of these powers and to recover its authentic purity as a people. Holderlin’s mystical and romantic poem summons forth some almost inscrutable images of soulful German nationality and offered inspiration to Heidegger’s leanings, which now took on something of a shift in focus from the authentic individual to the authentic society. Present-day admirers of Heidegger’s thinking feel that there is much in his thought worth preserving, but that some of his ideas (which are notoriously difficult to decrypt) need amending. Prominent among these people are French academics like Derrida, Foucault, Stiegler, Nancy, and Lacoue-Labarthe. These thinkers have had a recurring dialogue with the thought of Heidegger in their attempts to dig out what is essential and worth preserving. The Ister movie is a something of an episode in this recurring dialogue. Human memory in the brain, the content of which is lost upon the death of the brain. The scaffolding afforded by tools. The tool-based scaffolding enables man to be historical, but since the scaffolding is changing all the time (and remember, Stiegler sees these prostheses as actually part of man), man, himself, is changing all the time. Thus man is always forced to ask himself, “who am I?”. Since different nations have answered this question in different ways, they see themselves as human and the “other” as non-human or less-than-human. This leads to the inevitability of wars. These thoughts expressed by Stiegler represent something of an extension, but also a departure from, Heidgger’s thought. Jean-Luc Nancy, the next speaker, moves the focus more directly into the political domain. Prior to the appearance of democracies, he says, all sovereignties described themselves as eternal. They always were (they made up myths to make this false claim), and they would always be. But with the advent of democracies came the awareness of how they were born: a tyrant had to be overthrown. Thus, while the sovereigns are “eternal”, democracies are “temporal”, they are aware of their own violent origins. the establishment of laws (and hence the use of logical argument that trace the consequences of these laws). Nancy suggests that the rise of the use of logical argument in public discourse led to the appreciation of step-by-step sequencing: one thing follows from the next. And this led to the rise of technology as a social force: mythos was replaced by logos. This progression of ideas lies at the heart of all Western philosophy. But because conflict and logical progression is intrinsic to Western philosophy, it cannot properly conceive of the time of poetry, before this process of logical progression started. In our present, logic-dominated world, this never-ending search for the “true” means that we are never permanently “at home” -- the current "truths" are only temporary. And so we suffer the feelings of alienation (see “Existentialism in Film 1"). How could Heidegger put all of these things on the same level? Lacoue-Labarthe eventually comes around to saying that there is something fundamentally missing from Heidegger’s analysis of technology, and that is the moral dimension. Because of this lack, it calls into question Heidegger’s entire deconstructive enterprise. On the one hand, technology provides man with the scaffolding to record events. This meant that it gives man access to temporality. On the other hand, Heidegger felt that technology can only engage in inauthentic calculations and will inevitably miss out on the originary (authentic) aspect of time that comes from the nature of human care. This led Heidegger to dismiss technology as something inauthentic for man’s nature and was the principal reason, according to Stiegler, why Heidegger got stuck and couldn’t continue on the project to complete the second part of Being and Time, which was supposed to cover temporality. Stiegler, who sees technology as something essential to man’s nature, feels he can continue the Heideggerian enterprise in the right direction, with a proper appreciation for the fundamental importance of technology. "The Jewish interpretation of the world followed upon the Christian, just as the Christian one followed Roman and Greek culture. So now Jewish analyses, images, definitions of art, science, sociology, literature, politics, the information media, dominate. Marx and Freud are the pillars that mark the road from East to West. Neither are imaginable without Jewishness. Their systems are defined by it. The axis USA-Israel guarantees the parameters. That is the way people think now, the way they feel, act and disseminate information. We live in the Jewish epoch of European cultural history. And we can only wait, at the pinnacle of our technological power, for our last judgment at the edge of the apocalypse…. So that's the way it looks, for all of us, suffocating in unprecedented technological prosperity, without spirit, without meaning... Those who want to have good careers go along with Jews and leftists [and] the race of superior men [Rasse der Herrenmenschen] has been seduced, the land of poets and thinkers has become the fat booty of corruption, of business, of lazy comfort." Barison and Ross, of course, reject this false Romantic view. For them, the heroes are the French, who are in the process of rescuing Heidegger’s ideas from this German romantic poison and inserting the crucial elements of humanity that were missing in the Heideggerian version. Even Syberbeg at the end realises that Holderlin’s romantic vision of the Ister river is gone forever, and in fact was always a myth. The Ister river is a brute presence in the world and has often been a fundamental part of man’s engagements in its region -- and it will continue to be so. It's flowing nature will always offer various opportunities for cultural metaphor. For Holderlin, the German Romantics, and even the Nazis, the metaphor that they arrived at was false and led Germany in the wrong direction. We come back to Stiegler's assertion that technology's dynamism is constantly forcing us to face the question: who am I? In attempting to answer that question, the Romantic Germans, down to the Nazis, went so far as to claim that they were the descendants of the tragic-age Greeks and that they should free themselves from the weakening influences of Western culture that produced humanism. The French Heideggerians, not caught up with the Germanic obsession of their tragic destiny, were free to employ Heidegger's phenomenological methods with respect to technology in more fruitful ways. OK, it’s an intriguing and provocative thesis, but the film, itself, fails to deliver, because it fails fundamentally as a narrative. It’s not really a road film (or a wasserstrasse film), since the feeling of a narrative journey is mostly missing, despite all the signposts and title pointers along the way. The repetitive use of the same images also fails, even though some reviewers have praised the “decontextualising” nature of these repetitions that offer a “fugal” structure to the film. No, I don’t think so. Such a careful structuring would have been nice, but the film, as it stands, doesn't have a narrative presence. The interviews are somewhat woolly, too, with long pauses and stray background noises getting in the way. Thematic characters like Antigone, who figured prominently in Holderlin’s poem, appear to be awkwardly inserted into the film and then dropped. Overall, the viewing experience was not as enlightening as it could have been., and the film's effectiveness, such as it is, is primarily as a written text presented on the screen for reading. This is not an existential film, and it does not exploit the potential that the cinematic medium offers for existential engagement on this subject. It was a bold and challenging effort, but it came up short. All of this discussion finally brings me to “Carloss James Chamberlin”’s lengthy essay, “Draggin’ The River: The Ister”. Despite its overly ironic style, and even though I reject many of its dogmatic assertions about Heidegger, one has to admit that this piece is packed with erudition and insights. Although it’s more like a verbal guitar riff than a carefully structured thesis, Chamberlin’s piece is actually a more compelling narrative, more “cinematic”, if you will, than the The Ister film, itself. If you are interested in Heidegger and only have three hours, read the essay.